Making cheap snacks is a great way to fill you up, even when you're on a tight budget. The following snack recipes don't cost much, but they are delicious and satisfying. This spicy popcorn doesn't cost much, but it provides lots of satisfying crunch and spice. It uses spices you're likely to have in your cupboard already. 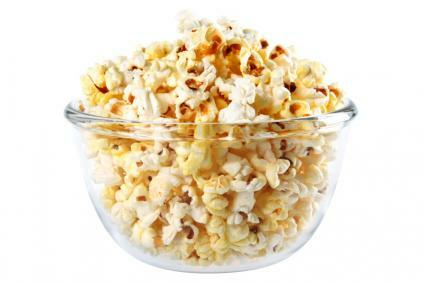 To save even more money, use air popped corn instead of microwave popcorn. Pop the popcorn while the oven preheats. Drizzle popcorn with butter and toss with spices. Spread popcorn on a baking sheet and bake in preheated oven for about five minutes to crisp the corn. Serve hot. Slice inexpensive apples into wedges and dip them in this inexpensive sauce, which contains ingredients you probably already have in your pantry. In a small saucepan over medium-high heat, melt the butter. Stir in brown sugar and bring to a boil. Boil, whisking constantly, for three to four minutes. Whisk in cream cooking and stirring until smooth. Slice apples into wedges, removing seeds and core. Serve with with butterscotch sauce for dipping. If you've got a leftover russet potato, then you've got a snack. These low cost potato chips are also healthier than fried chips in a bag. They're great sprinkled with salt, or you can chop other herbs you have available to sprinkle over the top of the chips. Slice potato into 1/8 inch thick slices. Arrange potatoes in a single layer on one or two baking sheets. Bake until chips are crisp, about 15 to 20 minutes. This is a great way to use leftover tortillas and grated cheese. You can use either corn or flour tortillas for this snack. Place a tortilla in a 12" nonstick sauté pan over medium heat. Fold tortilla in half to cover cheese. 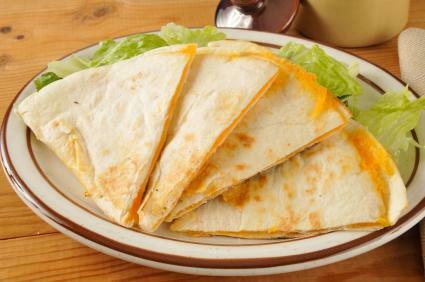 Cook on one side until cheese melts and tortilla begins to brown, about two to three minutes. Flip the tortilla and cook until it begins to brown on the other side, another two minutes. Cut quesadilla into wedges. Serve with ranch, dipping the wedges into the ranch dressing. All of the ingredients for this quick snack are inexpensive and easy to find. You can use any type of leftover lunch meat or a few slices of pepperoni. You can also find pizza sauce in a squeeze bottle at the grocery store for just a dollar or two, or use a tablespoon or two of tomato paste. Toast the bagel halves until lightly brown. Spread each half with 1 tablespoon sauce. Top sauce with pepperoni slices. Broil until cheese melts, 2-3 minutes. This healthy snack is also inexpensive. Buy whatever crisp vegetables on sale, such as carrots, celery, cauliflower, or peppers. The dip is made with cottage cheese, which is an inexpensive form of protein.This makes quite a bit of dip, so you can have it for a few days or just make half a recipe. Combine cottage cheese, mayonnaise, and ranch dressing mix. Use your favorite lunch meat and cheese along with a tube of premade (unbaked) crescent rolls. While this makes about eight to ten rolls, they are small and will keep well for a few days in the refrigerator for a quick but filling snack anytime. Cut lunch meat into rough triangle shapes to fit onto each roll. Place lunch meat on roll and sprinkle with cheese. Roll into a crescent and place on an ungreased cookie sheet. Bake until golden brown, about 11 to 13 minutes. 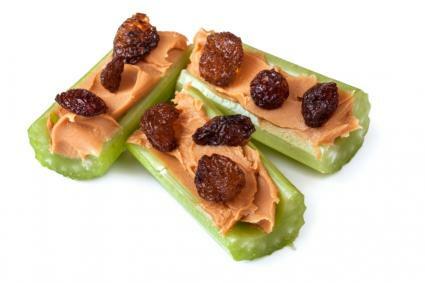 Bugs on a log is a snack favorite for a reason - it's quick and inexpensive to make because it uses cheap ingredients like celery, raisins, and peanut butter. Because of the fat and protein content of the peanut butter, as well as the fiber in the celery, it's also very satiating. Wash and dry celery and cut into two to three inch pieces. Spread celery with peanut butter. Place raisins in a row on top of the peanut butter. These chips work best with stale bagels, so you can buy day old bagels on special at the grocery store or just use some that would have gone to waste otherwise. Using a serrated knife, cut bagels into thin slices. Place bagels in a single layer on a baking sheet. Melt butter and stir in garlic. Brush half the garlic butter on the tops of the bagel slices. Flip bagels, brush with remaining garlic butter and return to oven. 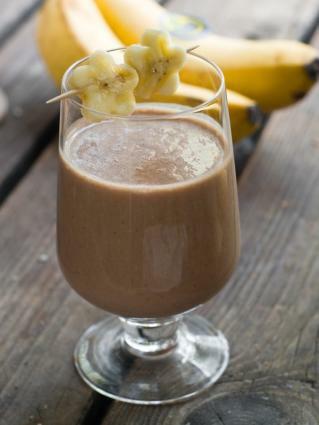 This is a great way to use up old bananas that might otherwise go to waste. It has other inexpensive ingredients you probably already have on hand, including milk, peanut butter, and chocolate milk powder. Peel bananas and cut them into chunks. Freeze the bananas in an airtight container until you are ready to use them. To make affordable, delicious snacks, use ingredients you already have in your kitchen, as well as those that will go to waste if you don't use them soon. These snacks will fill you up and keep you satisfied without breaking your budget.